My tiny woodland wildflower garden is outshining the rest of the garden with sweet little blooms this spring. "They survived", chant the garden fairies and gardener alike, as the tiny plants reveal themselves, blooming early like the rest of the garden. 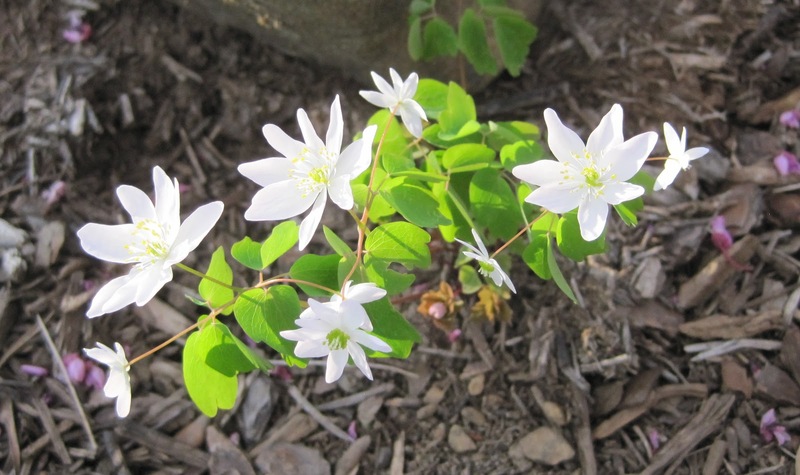 One of the showiest blooms so far is rue anemone, with its dainty leaves and sweet white flowers. What look like petals are actually sepals. I dug up this wildflower and several others from a woods in an area that was going to be logged out, dammed up and turned into a lake later in the summer. If that had not been the situation, I would never have dug up wildflowers from a woods to bring to my garden. Never. All the plants I dug up and transplanted are confined to a tiny area about three feet in diameter at the base of a redbud tree, Cercis canadensis. Confined is not quite the right word. They are planted there but if they decided to seed themselves elsewhere, that would be okay with me. Regardless, they seem happy there, happier than they would be if they were attempting to grow in the bottom of a lake. Other wildflowers in this little garden include twinleaf (Jeffersonia diphylla), trillium (Trillium grandiflorum? ), white violets (Viola blanda? ), may apples (Podophyllum peltatum), wild blue phlox (Phlox divaricata) and hopefully soon Jack-in-the-pulpit (Arisaema triphyllum). There is also another wildflower there with tiny white blooms similar to the rue anemone but with fewer sepals. I suspect it is false rue anemone (Enemion biternatum). There's something magical about a tiny garden such as this, separated from the rest of the garden by a ring of stones. Who knows what goes on in that area in the gloaming at the end of the day? I'll have to sneak out there sometime and see and then report back. For more on wildflowers, head over to Clay and Limestone to visit Gail and see who else has wildflowers blooming on this first Wildflower Wednesday of spring. How nice to rescue wildflowers and incorporate them into your garden! Well yes, better than at the bottom of a lake, for sure! HA Your wildflower ring sounds delightful, and I do imagine that Thorn and the group are enjoying these rescued beauties very much. I love wildflowers! I'm so happy you were able to rescue! Watch out for that may apple. It is a lot more aggressive than the other ones you listed. I've seen it grow in a field that used to be woods quite a while ago, successfully competing with field grass. It would be a great ground cover if it didn't die back by mid-summer. Keep your eye on it; it could easily smother some of the others. You may eventually want to put it by itself somewhere else. Maybe you could set up a motion detector camera nearby; I'm not sure you could ever really sneak up on those fairies.